CMON Limited announced today they are producing an updated edition of the widely-acclaimed board game Project: ELITE by designers Konstantinos Kokkinis and Sotirios Tsantilas. Originally released in 2016, Project: ELITE is a unique real-time, cooperative board game like no other. In Project: ELITE, players are members of the ELITE squad on a mission to stop the invading forces of an alien empire. Stopping the invasion will require players to speedily roll dice as they take part in real-time, 2-minute combat rounds against waves of terrifying enemies. Once the ELITE members take their turn, the aliens will react. The game continues in this fast-yet-tactical series of rounds until the scenario is won or the aliens take the Earth. CMON’s new edition was developed based on community feedback from the initial release. Players can expect all-new art by Stefan Kopinski, Saeed Jalabi, and Henning Ludvigsen, all-new miniatures by Studio McVey, with personal oversight by Mike McVey, new card designs, new weapons, new ELITE members, new enemies, and more. Beyond the base game, CMON will also introduce expansions and more through a Kickstarter campaign set for Q4 2018. 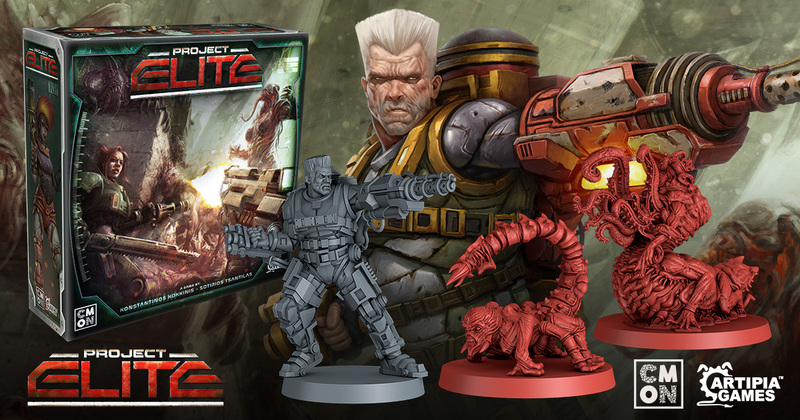 Project: ELITE will launch on Kickstarter in 2018 and will be available in retail in 2019. More information will be available on CMON.com in the near future!